OCMF Content Management Framework is a modern, reliable and responsive website platform created by Orange35 professional IT specialists who keep investing many years of knowledge and experience into it turning great ideas and custom solutions into life as well as making simple and complex functions easily managed without going through unnecessary set of controls. With so many platforms on the marketplace, why did you decide to create your own framework? Every platform basically serves one main goal including other options. For example, Magento is an excellent platform for an E-commerce website, that’s why our store is Magento based and what’s why we recommend using it to our customers who are looking to open an online store, but on the other hand, it’s pretty poor CMS-wise. WordPress is an excellents platform for Blog-typed websites, that’s why we use it for our Blog too, but we wouldn’t recommend it for a custom site solution. Our specialists faced the need of creating our own reliable, easily navigated and user-friendly system accented on narrow rather than broad functionality and mechanisms, because most people won’t need 90% of the things there are from the box. If the project requires a complex content review flow, integration with some third-party APIs, or User Interface elements, or any custom functionality it’s simply not worth getting thousands of custom modules to achieve your end goal, as the site becomes hard to manage and modules developed by different developers are almost never compatible with each other, which along with a problem of the stability of their update versions and performance require a constant developer’s assistance. Most CMS site platforms make you go through a complex set of controls to get what you need done, we thought and proved there’s a better way. What kind of a website is it suitable for? It’s perfect for custom projects, flexible, light, fast and intuitive. It doesn’t require a constant participation of a specialist into the process after the site is built. You’ll have a powerful set of administrative tools enough to maintain your website up-to-date and if your business evolves with time, it’s always easier to add in a certain functionality for your website built with OCMF platform than adapting a ready set of mechanisms of a different platform. It’s our own framework and we “tailored” it specifically for custom site solutions. We’ve been improving and investing efforts into it on a regular basis and so it’s just faster/easier for us to program a certain logic for a particular website than with a 3rd party platform, thus less expansive for the end client. What modules does it include? It includes many standard modules like Testimonials, News, Blog, Gallery, Banners, Newsletters, etc. that can be easily adapted for your specific needs. 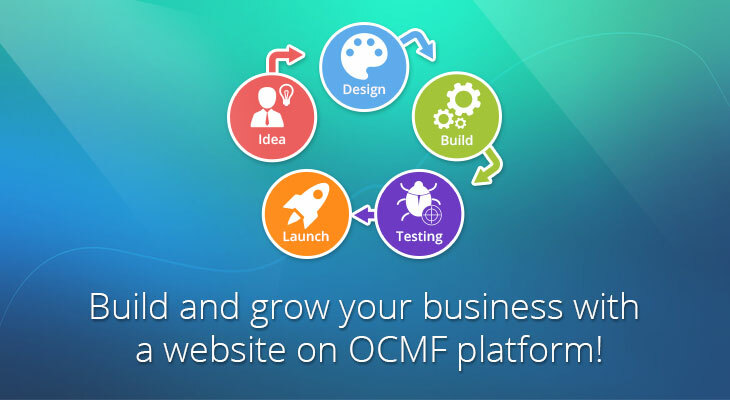 This list of OCMF standard modules will guide you through the main ready functionality offered by the platform. But that’s not all, our OCMF is also equipped with great E-commerce modules for online stores. It’s better to see something once than hear or read about it hundred times, thus, feel free to take a tour through the DEMO WEBSITE. The bottom line here is that with any platform, at the end of the day we’re still going to be writing custom functionality, but it’s a lot simpler and cleaner to implement it without having to “fight” a 3rd party platform along every step of the way. Company News, IT articles, Tips. permalink.